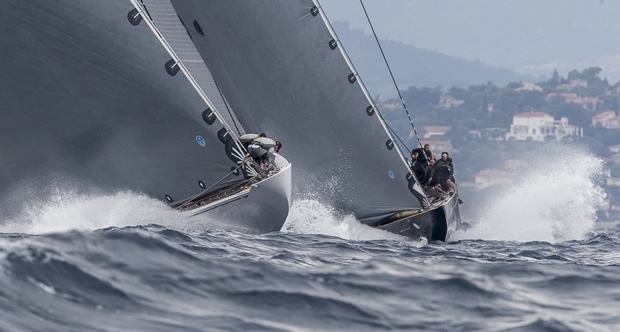 Ranger made it two wins in a row on a grey and rainy day at Les Voiles de Saint Tropez leading at every mark of the 20.8 miles second race of the regatta to cross the finish line off Saint Tropez with just over 40 seconds in hand over second placed Velsheda. The foundation for Ranger's second victory was laid during the 3.7 mile beat between the start line and the first windward mark. The course offered a mix of two sail reaches, two windward legs – the second of which was quite one sided – and a run back downwind in the Cote d’Azur’s drizzle. But it was sufficiently tight that there were few passing lanes and Ranger was able to stay clear of a feisty duel for second between Velsheda and Lionheart. After a two hour delay the NEEerly breeze of 14 to 18 knots was still accompanied by a bouncy swell, made worse around the confines of the line by the large number of boats setting up to start. Ranger stuck with its game plan, over the top of Lionheart to weather and able to press Velsheda off on to port tack. She quickly dealt with a potentially difficult situation when one of their primary winches broke immediately after the start, rendering it useless for the rest of the race. The Ranger crew's choice of a bigger, powerful G2 headsail, when Lionheart and Velsheda sailed all of the first two beats and a reach on their G3s, seemed to work well, coming off the start gun with better pace than the competition. Velsheda and Shamrock went right, towards the Saint Tropez shore where there was flatter water. Lionheart appeared to overstand slightly while Ranger made a nice job of easing down on to Velsheda’s line to close the door on them on the approach to the first turn to round 58 seconds clear of second and third. A spirited luff from Velsheda at just the right time on Leg 2 kept Lionheart in third, Tom Dodson and Hamish Pepper choosing to go left up the next beat to keep a lid on any advances by Lionheart and that remained the order across the finish line. Jones was pleased that Ranger’s two wins have come in lumpy, bouncy seas that are thought to be the yacht's Achilles Heel: “We started well, to the right of Lionheart and stuck close under Velsheda and that really got us to the first mark first. It was in good breeze and so we can hold someone off if you are to weather of them, and we did not want to get pinned on the left. The breeze moderated and so that worked well for us on the Number 2. “Losing the port winch was a problem. Starboard tack would have been a real problem, but fortunately we could sail straight until we laid. On the long beat out to the mark furthest out to sea the others were to our left, tacking on each other and it would have been nice to go over with them. We were not really confident on the starboard tack. The wind is forecast to moderate tomorrow but overcast, showery weather will continue.